The LA Lakers legend has pulled off the biggest deal in sports history – buying his hometown baseball team. A group that includes former Lakers star Magic Johnson and longtime baseball executive Stan Kasten agreed last night to buy the Dodgers from Frank McCourt for a record $2 billion (€1.5bn). The price would shatter the mark for a sports franchise. Stephen Ross paid $1.1 bn (823m) for the NFL’s Miami Dolphins in 2009, and in England, Malcolm Glazer and his family took over Manchester United in 2005 in a deal then valued at $1.47 billion (€1.1bn). As part of the agreement, the Dodgers said McCourt and “certain affiliates of the purchasers” would acquire the land surrounding Dodger Stadium, including its parking lots, for $150 million. Email “Magic Johnson group to buy Dodgers for record $2billion”. 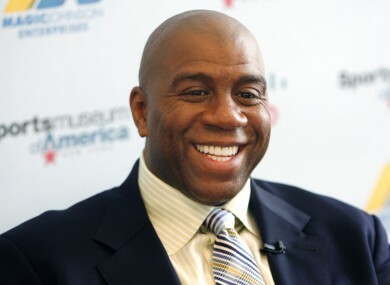 Feedback on “Magic Johnson group to buy Dodgers for record $2billion”.